Traffic congestion in big cities, as well as the high cost of car rental, could one day be a thing of the past, if the technological solution employed by one American company in Boston catches on. Chris McRobbie is a website designer with clients across the city of Boston. Several times a month he goes online to book a Zipcar, often at a moment's notice. He can choose from a variety of styles. He then heads for a designated location, sometimes inside a multi-storey car park or along a back street. For short trips this is cheaper than traditional car hire. There is never any paperwork and he does not have to arrange insurance because all drivers are pre-screened and covered automatically. Once he locates the car, Chris uses his plastic membership card to unlock it. He likes the idea of not owning one. It is less hassle, as well as more environmentally friendly, and it costs him less, he says. "The lease on my car was up and I compared the costs and I figured, with all the expenses, I spent $400 a month on a car. "So I figured I could do that for a lot less if I just booked the car by the hour. It was just cost effective." Attached to the windscreen is an RFID (radio frequency ID) reader, and a plastic card containing an RFID chip is given to each member. The door and ignition will only unlock at the start of the booking, so stealing such a car is difficult. The engine must also be switched off by the end of the rental period or an additional late fee is imposed. Extra time can be purchased by phone during the booking if needed. 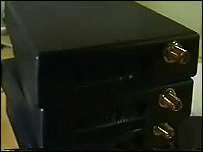 The RFID reader is connected to a wireless "black box" within the car. Packets of data are sent to and from the vehicle in real time to let it know who will be turning up and when. No human interaction is usually needed. Roy Russell, Zipcar's chief technology officer, says: "We can disable the ignition if necessary, and we can read the odometer [mileometer] on the vehicle. "That allows us to control the car to some extent, and it allows us to track the usage on that vehicle, so when one of our members returns a car we know how far they've driven." The automated nature of the business means it is a 24/7 operation, unlike many traditional rental companies. The cars are on a GPRS (general packet radio service) network rather than a GPS (global positioning system), because it is more reliable in big cities, as Scott Griffith, Zipcar's CEO explains. "Our system using cell towers is often more accurate in tracking in the tight urban markets that we operate in. "GPS satellites require line-of-sight visibility between the satellite and the asset it's tracking. When you get into a big city with tall buildings sometimes that's tough to do. "With our system, we're able to find a car whether we're able to get a line of sight to it or not, because we're using radio waves. "We turn that system on if a car is not where it is supposed to be." Massage therapist Craig Faucher got rid of his car, saving hundreds of dollars a month. However, an automated car rental service does have its downside, he says. "I needed to use a car once about three or four days after we got three feet of snow here. "The one that's near my house is in an alley, sandwiched between a fence and another car. "I got there and the car hadn't been cleaned off, there was no path for me to get in, and I hadn't brought a snow shovel. "It took me a long time to get the car out and I was late for an appointment." The service is popular in cities where traffic congestion, tolls and petrol prices have become excessive. 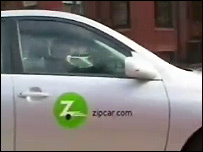 Zipcar claims that for every car it makes available, more than 20 personally owned vehicles are taken off the roads. So if the idea is adopted globally, petrol consumption and fumes could be reduced dramatically. Scott Griffith says: "In China today there are something like 30 million cars already in place. It's expected that could be 130 million in five years. "Large developing economies are places where they have the opportunity now to look at infrastructure in ways that we can't go back and redo." In the US market the key to expansion and adoption is ease of use, achieved by implementing proven software and hardware solutions. 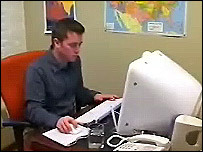 The company could be considered an early adopter of consumer RFID technology, having used it for the past three years. And now the goal is to make every vehicle in the fleet accessible with a Bluetooth device.